Once you have added a TLK 100 device to the WAVE Portal, it automatically appears as a User in your Users menu. From the Users menu, you can edit the Talkgroups and Contacts associated with the device. From the TLK 100s menu, you can edit the properties of the TLK 100 unit. This section describes how to edit the User associated with a TLK 100. For instructions on editing the TLK 100 device see: Editing a TLK 100 Device. Login to the WAVE Portal with your Customer account. Click the Users menu in the left frame. In the Users list, click the Display Name of the TLK 100 user to edit. Note: TLK 100 users are marked with a small radio icon. Radio units have a larger radio icon and Broadband units use a wave icon. Edit the the following settings as necessary. Each setting is defined below. Specifies the name of this User/Device in both the TLK 100s menu and in the Users menu. It also determines the Alias of this user as it appears to other TLK 100 devices, radio units with displays, and Broadband units. Select Allow Portal Access if you want this user to be able to sign in to the WAVE Portal. This will allow them access to the WiFi Networks list to configure additional WiFi access points they may need for connectivity. In the Talkgroups section, select the Talkgroups this use will have access to. 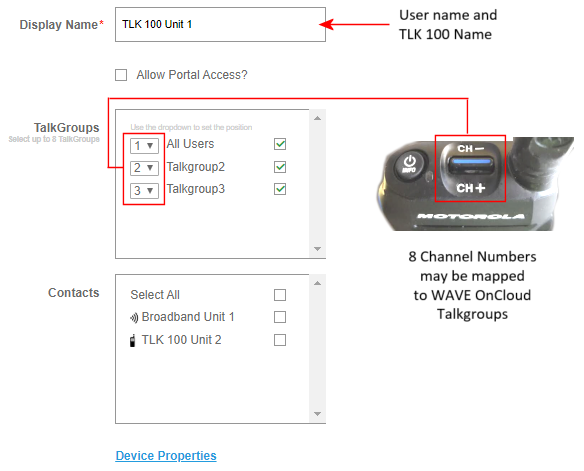 Select a number from the left drop-down menu to specify which setting on the TLK 100 to associate with each Talkgroup. TLK 100 users can switch between 8 different Talkgroups using the rocker switch on the top of the TLK 100. In Contacts, select the Contacts that this TLK 100 user can Privately Call. Clicking Device Properties from this page switches you to the TLK 100 device properties page. For instructions on editing the TLK 100 device properties see: Editing a TLK 100 Device. Click the SAVE button when you have completed making changes and you will be returned to the User page.